MEN AND WOMENS SWIMMING AND DIVING; DYNASTY? There comes a point where any great team can jump the barrier from mediocrity to forever seal their names in the history books for years to come. At PSAC Championships, held last weekend at Grahams Aquatics Center, West Chester University’s men and women’s swimming and diving teams continued building on their untouchable resume, adding a 17th straight PSAC Championship win for the men, and a ninth straight victory for the women. Seniors Kendall Somer and Jared Haley led the way for their respective teams. Somer, a local product from Unionville, Pa., grabbed an individual PSAC victory in the 1650-yard freestyle with a time of 16 minutes and 55.97 seconds. 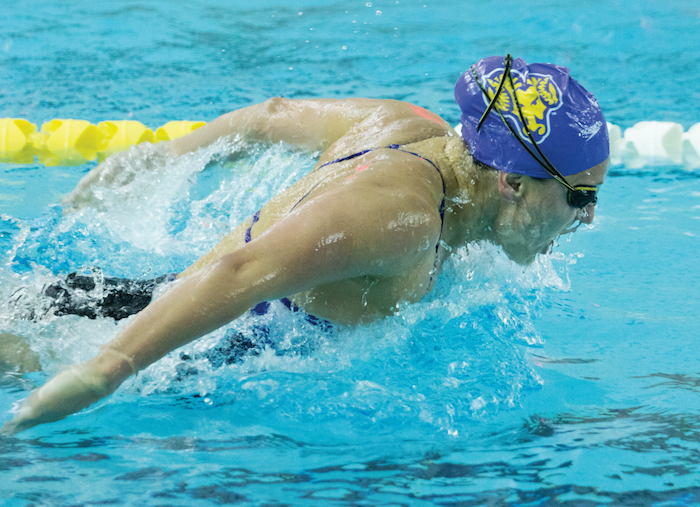 “The mile was actually my first individual PSAC win, and having this race on the last day to end my PSAC career was great.” The victory by Somer made her one of only 10 swimmers that scored points for West Chester. However, the Golden Rams still found a way to stay afloat and pull off the underdog victory. “It took a lot of working together to get our ninth [consecutive] conference title,” said Somer, “Every single girl has their own role and without all thirteen of us, I really don’t think this would have been possible.” The biggest key to the surprising victory for the Lady Rams was the all-around team effort. Despite only having 13 swimmers, 10 still scored points for the Rams. Experience and teamwork is what sealed the win though, according to Somer. “We all had worked so well together and really meshed as a team,” commented Somer when asked about what the driving forces were of the victory. The women built up a total of 636.5 points over the four-day event, enough to lead by a landslide to any one else. Their first place victory marked their ninth straight victory and thirteenth PSAC Championship overall. On the other side of the spectrum, the men continue their dominant ways just as they have all season. Haley, a senior from Dillsburg, Pa., was named MVP after winning three events he participated in (500 freestyle, 1000 freestyle, 800 relay). Haley also grabbed second place finishes in the 200-yard freestyle and the 1650-yard free. The men’s team could not be stopped. From the beginning of the weekend till the last race, West Chester dominated the pool. Totaling out at 977.5 points as a team, 300 more then any other team, the Rams swam as fast as they could straight away from the competition. Along with Haley, Eric Long set a new PSAC record for the 200-meter butterfly posting a time of 1:49:37. Golden Ram standout Victor Polyakov, who has been outstanding for the Golden Rams in the past three seasons, set yet another PSAC record for the 100 backstroke with a time of 49.30 seconds. Polyakov, the junior distance swimmer from Toganrog, Russia, has been a cornerstone in the success of the Golden Rams since his arrival to West Chester. Last year, Polyakov went a perfect 4-4 at nationals, becoming a four-time individual National Champion. Overall, the weekend could not have gone much better for the women’s and men’s swimming and diving teams. Sure, everyone has different views on what a “dynasty” really is. The Golden Rams have etched themselves in to the conversation of a dynasty, rightfully so. With another successful season nearly in the books, both teams can look back and be proud, yet again, of what they have accomplished in the pool.